Greetings from Eranakulam, a busy little town in Kerala, most known for its proximity to Fort Kochi (formerly Cochin), one of South India’s grand tourist destinations. The region has had contact with the West for thousands of years. Jews first arrived here after the destruction of the second temple around 70 C.E. Christianity arrived here long before it did in many parts of Europe. The Portuguese, Moors, Dutch and English have all had their grubby hands on the place. Ancient Romans started the spice trade here when they discovered the Monsoons would bring them in and take them away like clockwork. And Cleopatra herself had once planned to re-establish her empire in Kerala, just as Octavian’s armies were closing in on her faltering dynasty. Why did they all come here? For the spices. Originally, black pepper was the lure that drew them. Later, it was cardamom, ginger, saffron, tea and even imported cinnamon from further south. Today the tourists flock here for spices, dance culture, some run-down beaches, the pleasant people and for a taste of old India, not quite ancient, not quite modern. Indeed, at one point while having a snack at a cafe, I did a double take. I suddenly realized the cafe was in fact the 16th century home of… Vasco da Gama! Cool. Yes, I’m working. I’m holed up in a hotel room breaking all my dietary rules (pasta and Coca Cola), trying to finish a paper. Yesterday, however, I took the time to see the sights. No trip to Kochi is complete without seeing the old Chinese-style fishing nets, which are counter-weighted in a clever fashion. When I was here last, 15 years ago, I was also able to visit an obscure martial arts school which taught Kalaripyattu. Today, the art has grown in popularity so much that demonstrations are given nightly at the cultural centre. Kerala is also famous for its tourist-friendly Ayurvedic clinics. If you’ve never had an Ayurvedic oil massage, it’s something between medicine and molestation. Thus, I enjoy it. 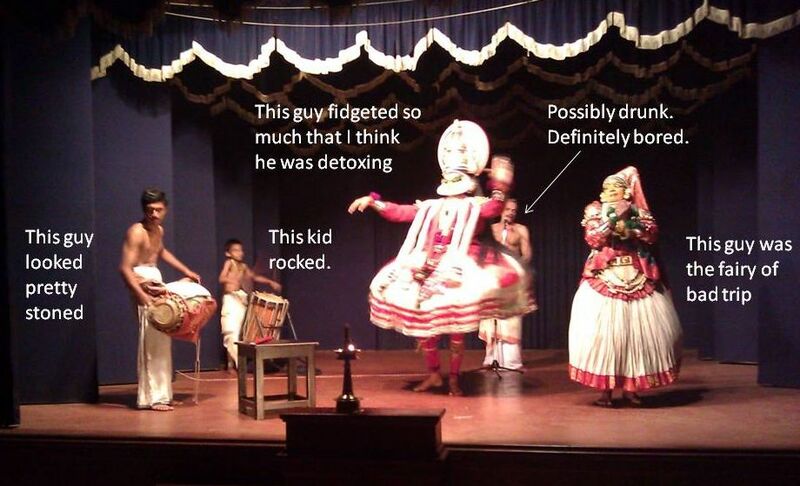 Had a good one yesterday (the massage, not the molestation, though sometimes it’s hard to tell the difference) and barely made it to a performance of Kathakali dance. Now, I’m not a big fan of Kathakali. I’ve seen it before, and I appreciate the discipline and rigour and historical importance, but I always fall asleep during a performance. This time was no different. The performance was seriously like a medium-strength acid trip. The performers emote through make-up and extreme facial expressions. The backing band for this demonstration were something out of a Wall of Voodoo video. The lead drummer was expressionless and looked totally stoned. The second drummer, who looked all of 8 years old, was going nuts on the drums. The singer, who spent most of the time playing a kind of tambourine, looked both bored and drunk. In some circles, Kochi is famous for its 16th century synagogue, situated in “Jew Town”. Yes, that’s what it’s called. Nice place, but the walk there is, of course, peppered with souvenir shops manned by the requisite clingy hawkers. My favourite was the store with the big sign in front that read, “Hassle-free shop!” It was the one with the loudest and pushiest fellow trying to herd us in. Oh irony, thine name be India.